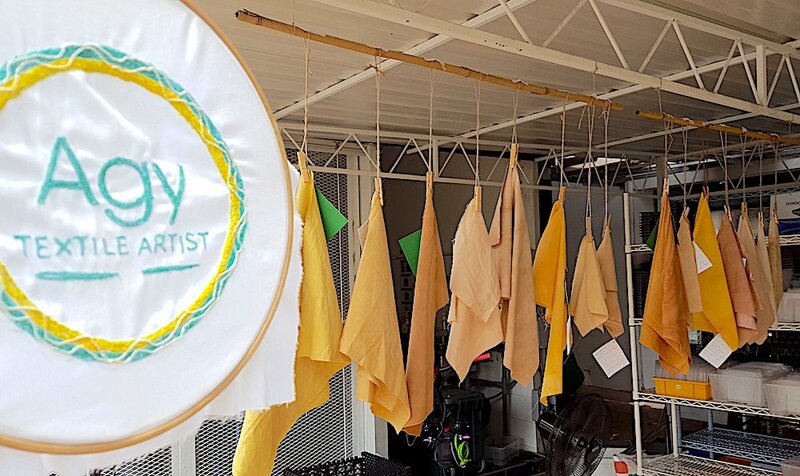 Agatha Lee, or Agy, for short, is a long-time environmental advocate who raises awareness of environmental sustainability through her work with textiles. Formerly from Hong Kong, she has been living with her family in Singapore for almost two decades now. She spent half of that time here at the National Environmental Agency before finding her true calling in sustainable fashion, starting with an informative blog on repairing and upcycling clothing, and then co-founding Connected Threads Asia, which runs the local Fashion Revolution Day annually. She eventually moved on to focus on personal artistic projects. After spending many years honing her craft, Agy developed into an artist, using natural materials and discarded fabrics to create wearable fashion or art pieces, always remaining true to her sustainability roots. She now goes by the name Agy Textile Artist. These days she also busies herself with The Green Collective, a gathering of local eco lifestyle brands in one place – offering retail, co-working office space and workshops. I’ve known Agy for some years now in the environmental sector, but it was only last year that we began collaborating on workshops, mainly beeswax wrap classes. I’ve always admired the work she does and I love her refashioned pieces, especially her latest wardrobe addition – espadrilles made with fabric scraps. Agy is very creative indeed! Apart from natural dyeing, she specialises in free motion embroidery, a technique she has used to create artwork from her Nature in Stitches series, and Ocean series, the latter being a collaboration with another artist, Arana Kennedy. Some of this work is documented on her YouTube page, along with other artistic endeavours such as various mending techniques, the natural dyeing process, as well as hand embroidery, so be sure to check it out! I spent some time with Agy and created my first Garden Stories video on YouTube. Here’s my interview with her. 1. When did you discover your love for working with plants? I enjoy working with plants and experimenting with their colours. I realised it when I started to explore the parks in my neighbourhood two years ago when I needed to slow down in life. As I reconnected with nature, I started to notice their different textures and how their beauty could be translated into stitches and colour in textiles. There are so many plants in Singapore, and I have to admit I have only touched the surface. 2. Where do you get your inspiration for your creations from? Nature! There’s so much inspiration out there, you just have to look! I love observing my surroundings and how the public interacts with it. My first work was a series called Nature in Stitches, where I interpreted the bark of common trees in Singapore using natural dyes and free motion embroidery. I then worked on a collaborative piece called Ocean, which looks at how man’s interference with nature has a negative impact on corals. When it comes to fertilising her plants, Joanna mostly uses soil amendments like spent coffee grounds, tea leaves, and crushed eggshells, on rare occasions she uses organic chicken manure. She shared that her pots contain earthworms that help with soil conditioning also. Which then leads me to her penchant for breeding and raising of worms, caterpillars and moths – this is to do with her love of pollinators, and she keeps pollinator-friendly plants to cater to their needs. 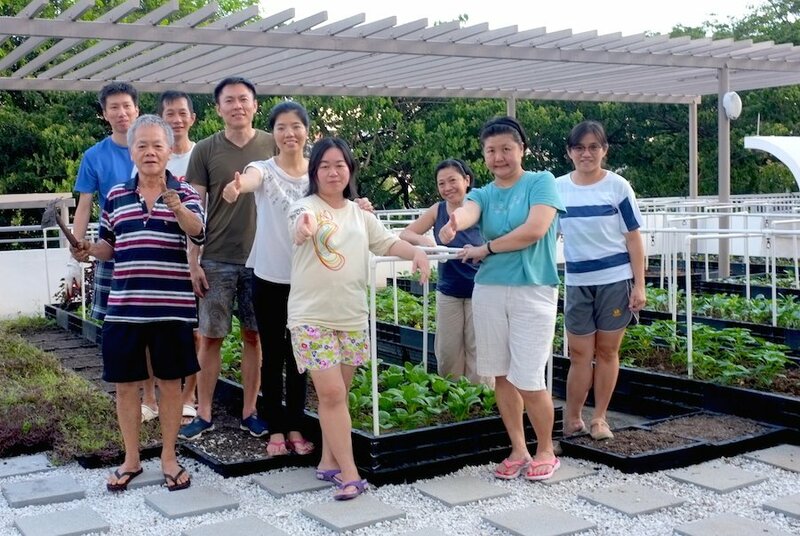 On the top floor of a disused carpark space in Bedok, a group of 20 residents collectively grow, harvest, and cook for one another using produce from their rooftop community garden. Our Kampong Farm has taken a different approach to most community gardens, opting for the communal farm model – where everyone puts in their fair share of work and enjoys the harvest together, rather than designating individual allotments. I felt inspired by what I saw, and could feel a sense of community spirit from this group of urban farmers. This sprawling rooftop space is managed by 20 people, and currently not all of it is used for edible plants. Spanning around 15,000 square feet, only 10 per cent of the space is used to grow a wide variety of herbs, vegetables and fruits like caixin, kang kong, spinach, Japanese radish, lettuce, eggplant, tomato, pumpkin, bittergourd, watermelon, musk melon, okra, long beans, chilli, Thai basil, rosemary, perilla, pandan, aloe vera, oyster plant and papaya, among others. 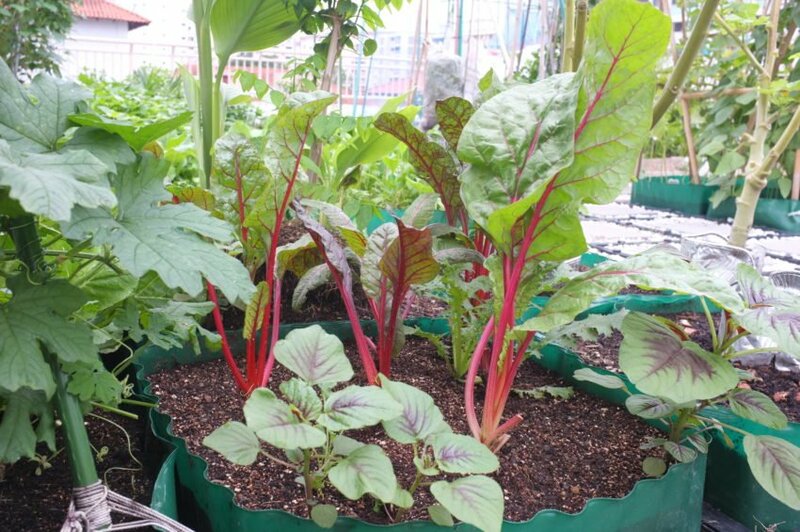 These urban farmers keep their expenses lean by taking what is normally considered waste from food vendors in the vicinity and using it as fertiliser. Given the number of plants here, store-bought fertiliser would not be cost-effective. 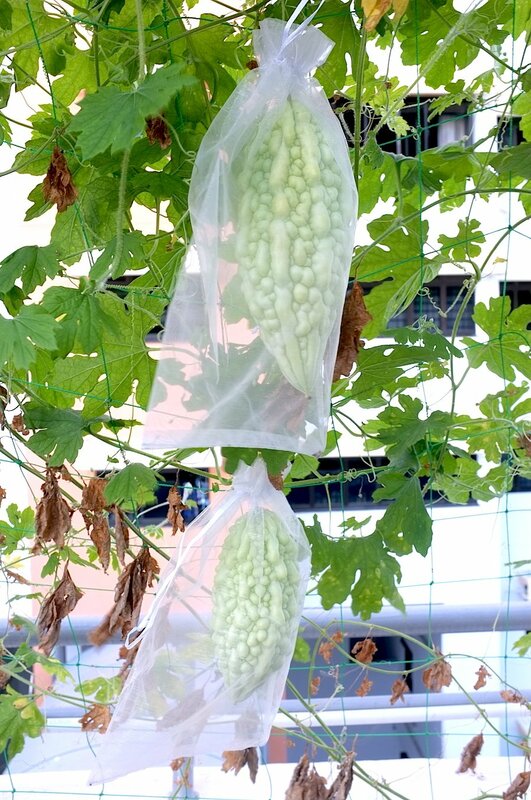 In addition, they use a drip irrigation system for some of their plants, reducing water wastage and fertiliser run-off. Desmond Tan, who is part of the team, shared that okara, a by-product of making tofu, has proven to be a highly nutritious fertiliser, and dried banana peels have given their tomato plants a fantastic potassium boost. Food waste is certainly a resource that we don’t use enough of. In this interview, Desmond tells us about the journey of Our Kampong Farm and lessons learnt along the way. Meet Mr Tang Hung Bun, a joyful, down-to-earth and all-round lovely gentleman. An avid nature lover and experienced permaculturist, Mr Tang is a former physics teacher, and has co-authored a book titled “A photographic guide to the dragonflies of Singapore“. He has since retired from teaching to focus on his passion of farming. He now volunteers with Farmily, a social enterprise which works with senior citizens through farming naturally-grown, pesticide- and chemical-free produce, it is also the farming arm of non-profit group, Ground-Up Initiative (GUI). 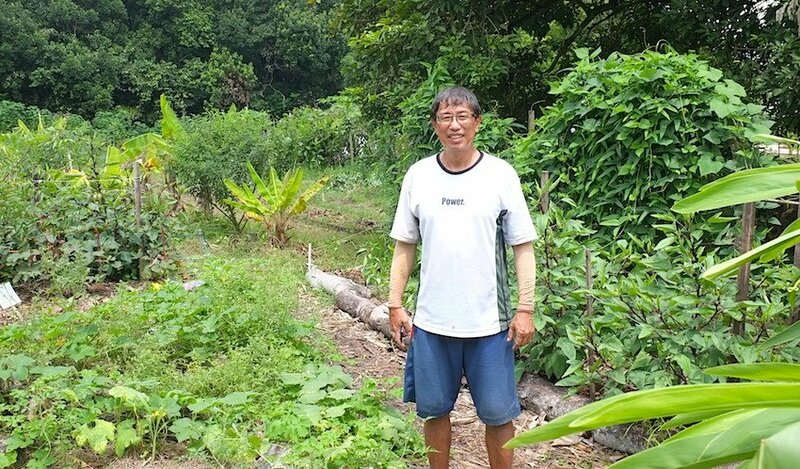 I first learned of Mr Tang through his blog, where he shared a soul-crushing video of his established permaculture food forest destroyed by heavy machinery. His landlord decided to lease the land that he rented to a developer, and what he had created in almost two years was demolished in three days. 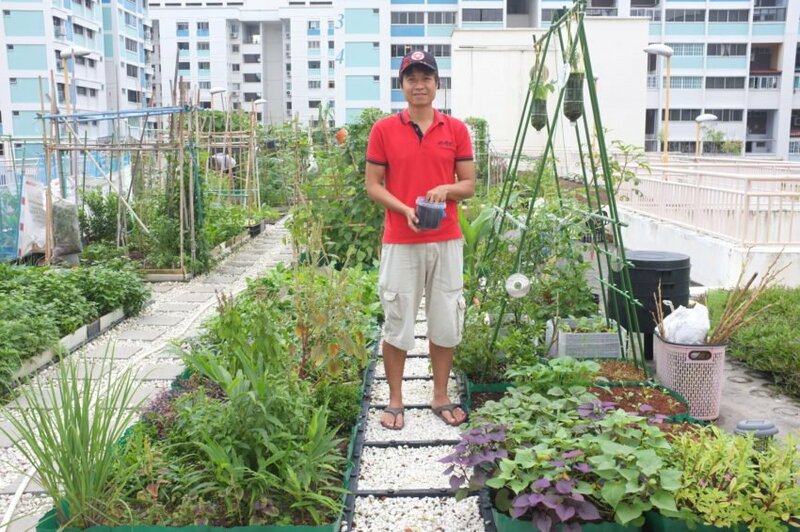 I would later hear my urban farmer friend, Ong Chun Yeow, mention Mr Tang in many of our conversations, and it took me quite a while to make the connection that he was that same person. I had the immense fortune of meeting him during my visit to Kampung Kampus, and he gave me an impromptu tour of a permaculture garden that he and other volunteers had been working on since mid-January this year, after a few of them discovered a small, temporarily unused plot on the premises. Here is a video of that plot before and after Mr Tang and other Farmily volunteers worked on it. Incredible and inspiring. One of the remarkable things about this garden is that they do not water it. 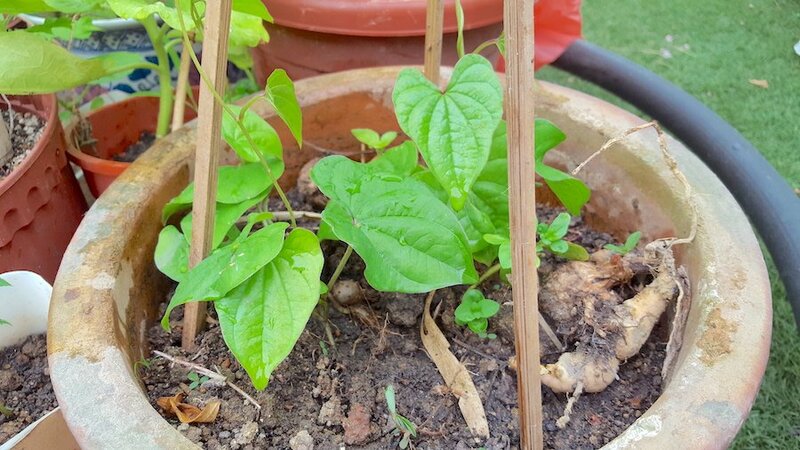 As you can see from the video, he grows wintermelon, eggplants, roselle, taro, chilli, currant tomatoes, okra, winged beans and bittergourds. Some of these edible plants are intercropped with marigolds, a wonderful companion plant, and the garden features several pigeon pea plants, a shrub favoured by permaculturists for its nitrogen fixing qualities and as “chop and drop” material, there is also a neem tree, which is also a nitrogen fixer, and has many medicinal properties, its small branches can be used as a natural toothbrush. It was such a pleasure to spend time with Mr Tang. Please read on to find out more about him and his interesting perspectives! 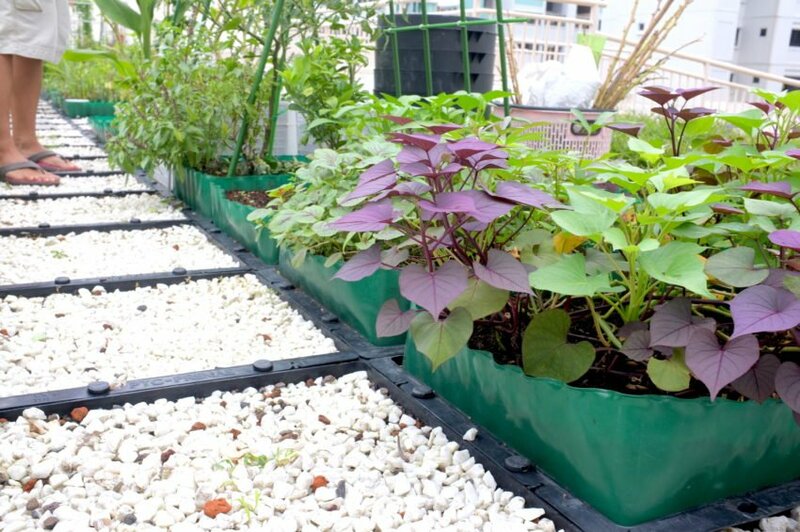 In Yishun, you will find one of only a handful of rooftop community gardens in Singapore, built atop a HDB car park. 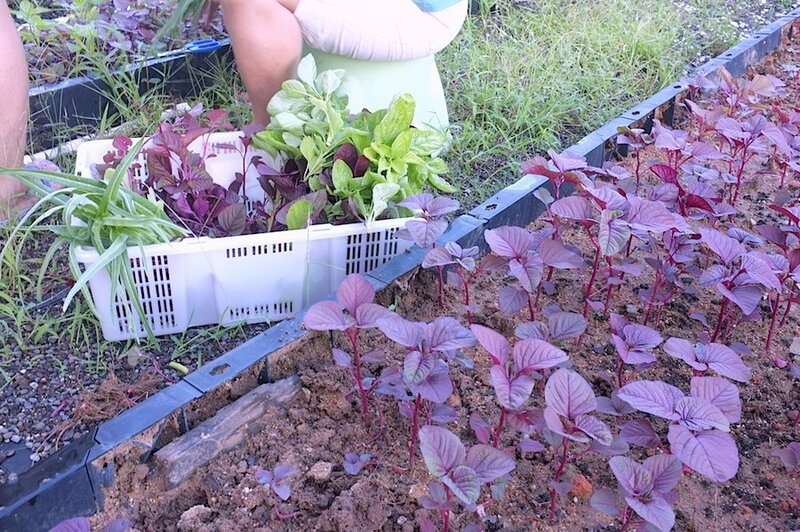 Ong Chun Yeow is one of several estate residents with a garden allotment, growing lots of leafy greens like purslane, swiss chard, and amaranth, herbs, galangal, as well as fruiting vegetables like bitter gourd, okra and tomatoes. 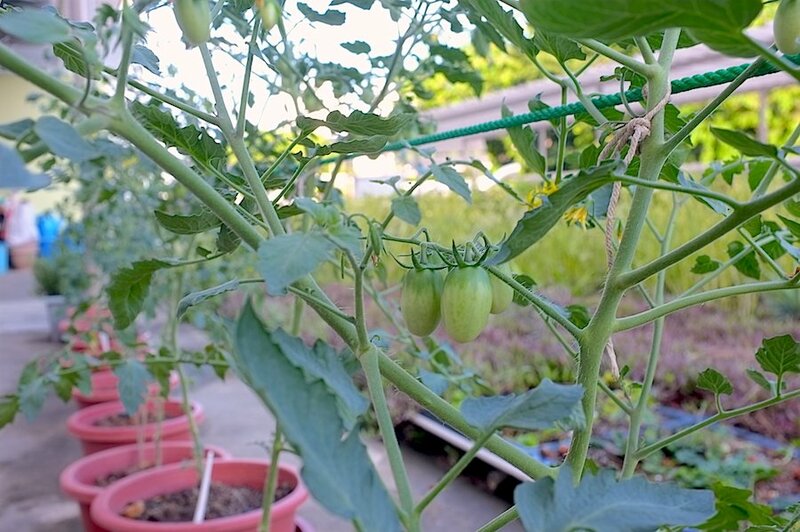 Opened in 2014, this rooftop garden features 30 garden allotments, which residents ballot for. 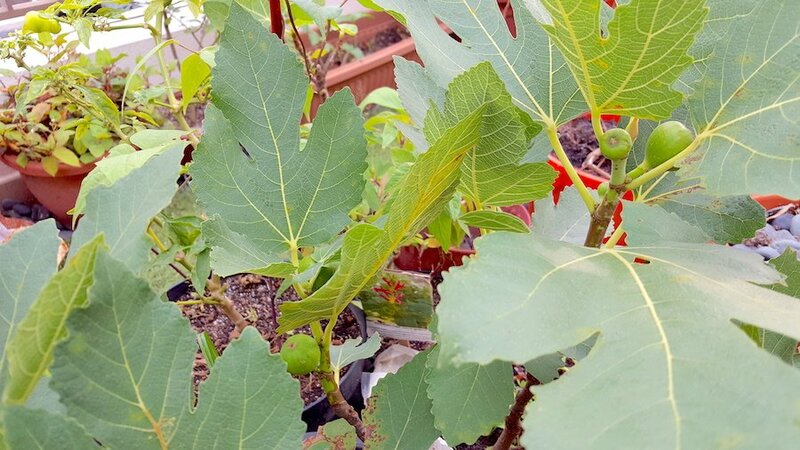 The diversity of plants in this garden is incredible, I saw corn, broccoli, kale, and strawberry plants, a papaya tree, different varieties of eggplants, gourds, beans, herbs and spices. Through clever space stacking and bio-intensive growing methods, one can maximise their yield, however limited the space, as can be seen in this garden. I also noticed many ladybirds, a beneficial insect and wonderful pest control agent, always good to have them around! I got to know Chun Yeow through my circle of environmentalist friends and we have been Facebook friends for years, but I don’t recall actually meeting him in person till this year. He is keen on heritage and environmental issues, desires to have a low-impact existence, and practices intentional living. He recently received his Permaculture Design Certificate (PDC) and is looking forward to more hands-on permaculture experiences locally and overseas. Whenever I ask him what he’s doing on the weekend, it seems like he’s usually involved in at least one urban farming-related event. As a lover of plants and nature, he’s also passionate about community building activities, such as those organised by Foodscape Collective. 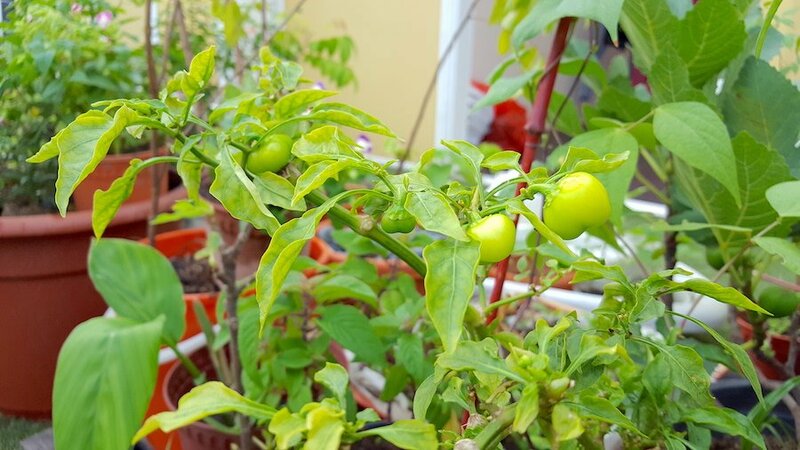 Find out more about Chun Yeow’s journey in this interview, and check out the photos of this marvellous rooftop community garden!